Imagine how different your outlook on life would be if you had absolute confidence that God was with you. Imagine how differently you would respond to difficulties, temptations, and even good things if you knew with certainty that God was in all of it and was planning to leverage it for good. In other words, imagine what it would be like to have PERFECT faith. In this new DVD study, Andy Stanley builds a biblical case for five things God uses to grow BIG faith. Each curriculum session includes 15-20 minutes of teaching from Andy Stanley. In addition to the small group sessions, this DVD is enhanced with six full-length messages from Andy Stanley. 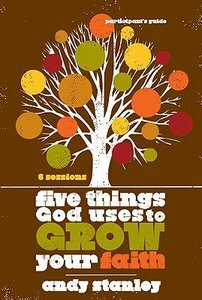 About "Five Things God Uses to Grow Your Faith (Participant's Guide)"